Remakes of Crash Bandicoot, Crash Bandicoot 2: Cortex Strikes Back and Crash Bandicoot 3: Warped. Download-only; no disc is included in the physical box. July 23, 2018 update changed where the save folder and file(s) are set up. Black bars at different aspect ratios than 16:9. Refresh rate is forced at 60 Hz in fullscreen mode. See Special K to force a custom refresh rate higher than 60 Hz for fullscreen mode. Can increase the performance a lot. 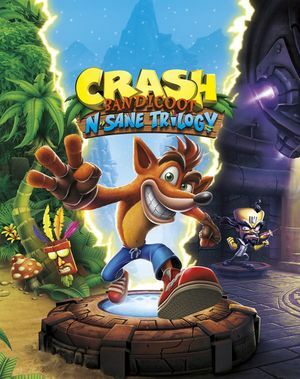 Download Crash Trilogy 3D Vision fix. Copy the files to the installation folder and press F6 to disable any fur. Change the value of Fur in d3dx.ini to 1 to let the mod disable it automatically at startup. See Helix Mod: Crash Bandicoot N. Sane Trilogy. Refresh rate is forced at 60 Hz in fullscreen mode. 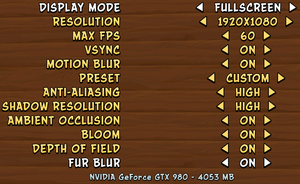 In Radeon settings set AMD CrossFire Mode to "AFR friendly" in the game profile, very good scaling. -4kf --4k-fullscreen Forces 4K resolution and fullscreen in the window. -4kb --4k-borderless Forces 4K resolution and borderless in the window. -perf4k --perf4k Enable perf reporter for levels at a 4k resolution. -perf --perf Enable perf reporter for levels at a 1080p resolution. -gpuWrite --gpuWrite Enable writing GPU info to file on PC. -wd %wd% --windowdatafile %wd% The window settings datafile to use. Defaults to WindowData.igx. 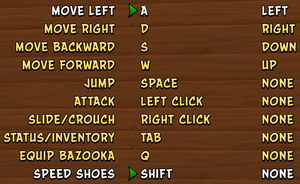 -pc %d% --primarycontroller %d% The primary controller to use [1,2,3,4] when launching into a map. -om %map% --overridemap %map% Map to use in place of debug map from configuration file. %d% - Current controller (decimal number) . %wd% - window settings datafile name. %map% - current level/boss/intro/outro. C1xx/L1xx/B1xx - Crash 1 maps. C2xx/L2xx/B2xx - Crash 2 maps. C3xx/L3xx/B3xx - Crash 3 maps. ↑ 1.0 1.1 File/folder structure within this directory reflects the path(s) listed for Windows and/or Steam game data (use Wine regedit to access Windows registry paths). Games with Steam Cloud support may store data in ~/.steam/steam/userdata/<user-id>/731490/ in addition to or instead of this directory. The app ID (731490) may differ in some cases. Treat backslashes as forward slashes. See the glossary page for details.